park, see the fires and hear the fighting. The military showed logical restraint, would surge forward, regroup and surge again. It was said there were up to 20,000 troops, I saw at least 6 tanks, 8 APC’s and loads of troops. 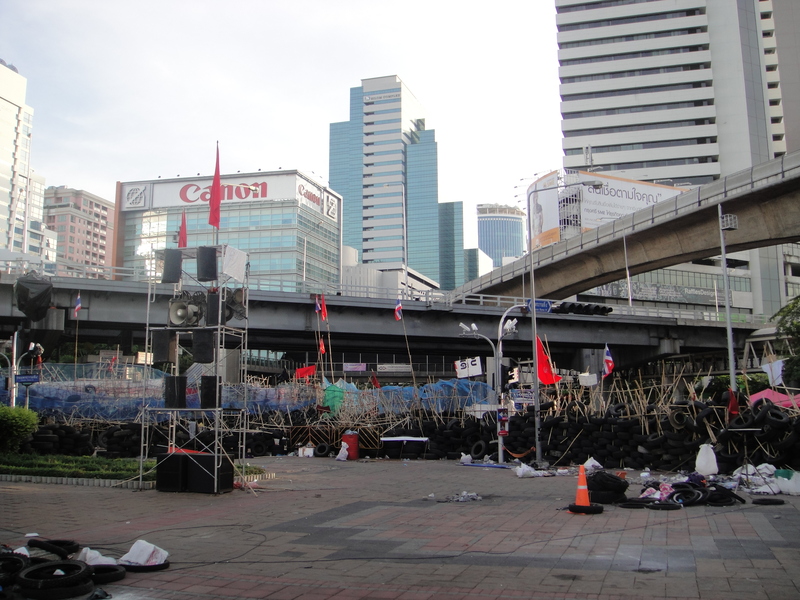 The military met little resistance at Lumpini- as of last night when I visited the barricade, there were very few red shirts left. Resistance grew as they approached the center of the rally- about 1k from Lumpini. At the beginning of the military surge there was dancing and singing coming from the rally site that you could hear through loud speakers, so odd and such a major disconnect to what was happening. It was estimated there were still 3,000 people left at the rally site and possibly 5,000. As the day wore on the speeches were made about staying together, one leader of the protest fled in a car, one said to hold hands and smile as the troops approached to show reds were peaceful and one gave some inflammatory speeches. As the last moment the leaders of the rally announced they were turning themselves in to the police and the rally was over. All hell broke loose. Within one minute M-79 grenades were launched, fires were set; my building felt the concussion of the M-79 grenades. The protestors were furious and began disbanding- women and children headed to government (safe) busses and to a temple that is a safe zone. 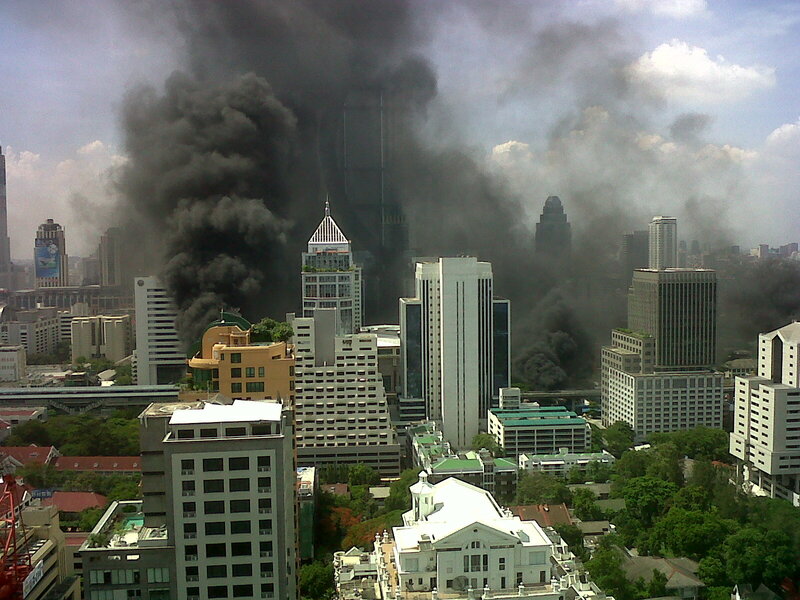 Other began setting fires and looting the upscale department stores and fled the protest sight to wreck havoc on Bangkok. 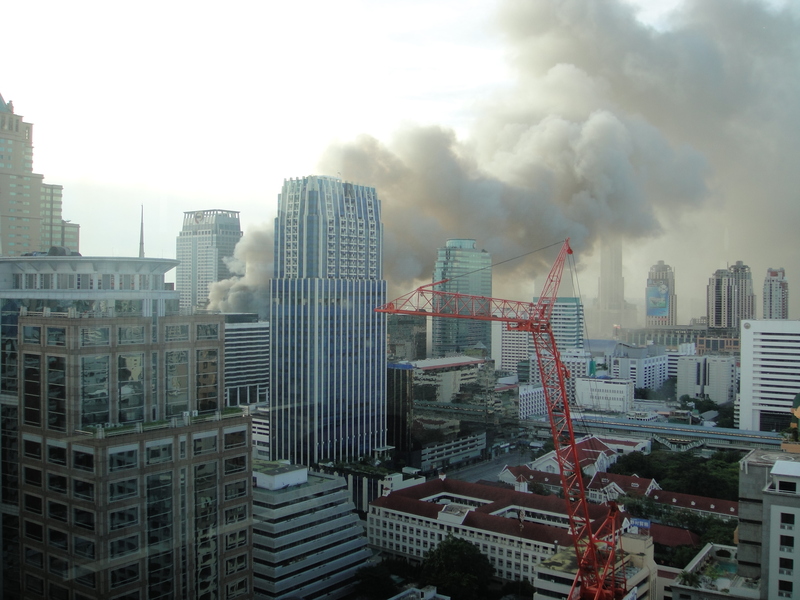 Bangkok is under a curfew tonight, a major shopping center is on fire and the stock exchange was burned. Groups of “red shirts” are still fighting, looting and very dangerous as they have no leader- are these real red shirts? Or the violent group that attached themselves to the red shirts? In the end the red shirts proved guilty of government accusations- heavily armed and with destructive agendas. The leaders of the red shirts have to take responsibility for this, it was their rally and they fed their following 60 days worth of speeches about fighting the rich and fighting until the end. as the red shirts left the rally site they broke into the Central World Mall and set the building on fire- this was as dark approached, still burning at 8:30.
protest. I am not trivializing 5 deaths, but it raises the question as to why decisive action was not taken prior to today and how the government let the red shirts entrench themselves in the first place. Thailand is divided by wealth and knowledge. It is shockingly evident that many red shirts don’t see the news and only learn by what they are told. This is not criticism, There is a large debate in the USA that the internet and high speed access to the internet will widen the gap between the classes. If you are a low-income farmer, will you have access to a computer, the internet and the time and knowledge to form your own opinions? If not, how are you receiving accurate information as the internet is increasingly the primary source for the rest of the world? There is a great deal of healing to be done in Thailand, the divide between “reds” and “yellows” is wider than ever. People in Bangkok are furious about the destruction done by the protestors, the protestors suffered many deaths during clashes and want to avenge these. The Thai spirit is one that can overcome anything. Walk down a street, see a person selling fruit for 10Baht in the heat and greeting you with a smile- day after day after day, you see the overcoming attitude. The real lesson is not what happens from here, but how we all prevent ourselves from reaching this point. Tolerance, understanding, dialogue and acceptance of opposing views are needed to avoid intolerance, groups cannot be tolerated that facilitate intolerance on a large-scale. Many of these things are not my strengths, I will change from what I have seen and learn. I fear where the USA is headed with our divide and intolerance in politics, income, religion and even race. I will be better for what I have seen and learned. I know that Thailand will be better as well; something good must come from this. Tomorrow is Thursday, on Friday my goal is to blog a collection of photographs from the streets of Bangkok showing the smiles this country is famous for. This entry was posted in Bangkok, Culture, Politics, Thailand and tagged Bangkok, Bangkok protest, is bangkok safe, Red Shirt March, Red Shirt Protest, red shirts, Red Shirts in Bangkok, Red Shirts Protest, Thailand, Thailand Politics, travel to Bangkok now. Bookmark the permalink. 1 Response to May 19- The military ends the red shirt protest, choas, next? Thank you for your optimism and for seeing the beautiful side of the Thai people. I too think that Thai people will overcome this tragedy but we will have to earn the sustainable peace and stability. I think the Thai government, the NGOs,the volunteers and the people in general understand this and if we can join effort in moving forward together , trying to leave behind our divisiveness and hatred and anger, perhaps we will recover soon.